Let’s see your best Invisibule lyrics or poems in the comments section below. If it needs music, remember to specify what type you’d like! Invisibules » Write your own Invisibule lyrics? Ahem…. I know pretty bad but it’s the thought that counts right? fantastic, you had me giggling! just a note, these don’t all need to be 12 bar ‘bules — remember to say what style of music you want! 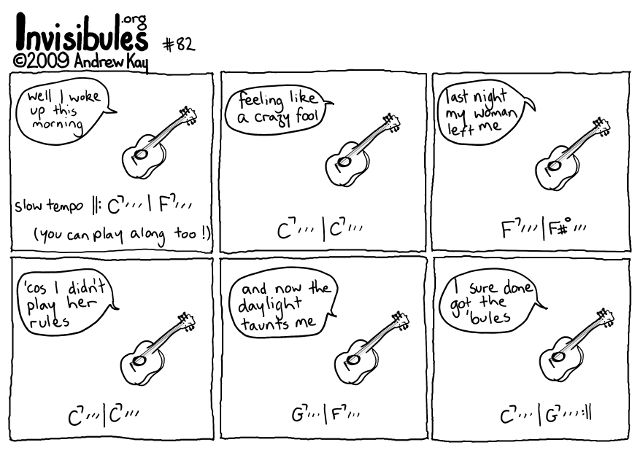 I actually wasn’t aiming for any particular type of blues… errr bules. I was just inspired by the (obviously) invisibule spirit guiding me at the time. I can’t get the music out of my head now though!